Re: Have You Experienced the Ignition Switch Issue? Oh now the news outfits all want to get involved, and no I did not get a plug. I had it happen to me once (other than the Passlock issue), and fortunately it was at a stop light. I was able to restart it after a few stressed minutes. We are fortunate to have a very active community of Saturn owners here on this site. When Saturn news happens, news outfits often check in to see how it impacts us. Sometimes reporters create accounts and interact directly with you, and other times they contact me for a high-level view of a situation. I think its pretty cool that you all have helped build such a respected community! I also think its a great that we have a way to give our concerns and opinions a "voice" outside the walls of SaturnFans.com. I am very grateful for your support and participation!! Thanks! I can see how that would be a stressful situation! I am glad you never had the problem when you were driving your Ion. iv never seen the plastic clip. im still debating whether i should go in for the ignition lock swap or not, since i never had an issue with my car, and afraid that after it gets changed, someone else will go wrong. I like to go "if it isnt broken, it doesnt need to be fixed". 94 Honda civic automatic "VTEC yo"
"A problem clearly stated, is a problem half solved." Rate the quality of this post and help kevin.st56 reputation points. Click the reputation button near the bottom left corner of this message box. Thank you! Because isn't that what all of this comes down too?? ?...People hang'n too much **** on their key ring causing the the key to turn the car off??? Sounds like simple physics to me. Granted., the switch SHOULD probably be strong enough to hold ten pounds of keys....right??!! Uh., anyway...I've only had my "lock/unlock" module on my ring and have never had an issue. Rate the quality of this post and help ChargerIon reputation points. Click the reputation button near the bottom left corner of this message box. Thank you! Yes, I experienced it. I had an 05 Ion 2, and the engine shut off out of the blue while driving on washboard out in eastern Oregon. I wasn't going more than 15mph, didn't lose control, and had no trouble stopping. There was nothing hanging from the key ring other than a small plaque. A few years later I ran into the passlock issue, at which point I replaced the ignition switch. Last week, Amazon notified me that the ignition switch I bought from them (ACDelco D1461F Ignition Switch) is being recalled. It was a nice car. I don't have it anymore, as it was totaled a couple of years ago, rear-ended while stopped at a red light. I considered replacing it with a Cruze, but opted for a Jeep instead. Factoring into that decision was a sense that GM were dragging their feet when it came to recalls. The passlock issue alone warranted a recall. There was another issue involving power steering that I never ran into, but plenty of people did. GM wouldn't issue a recall over that either. If I remember correctly, they recalled the Cobalt, but got away with just extending the warranty on the Ions. The way they handled the ignition issue is inexcusable, criminal. I'm sorry to say it, but after what's come to light recently, I'm done with GM. Rate the quality of this post and help viking reputation points. Click the reputation button near the bottom left corner of this message box. Thank you! I have never had my ignition shut off on my 04 Ion by itself, however im debating if I should get a replacement on this recall? I actually took off a couple old keys on my key chain the other day! When will parts be available for a recall? ? ? Gm needs to recall the sway bar bushings! Horrible design! Rate the quality of this post and help ddemier7 reputation points. Click the reputation button near the bottom left corner of this message box. Thank you! This ignition problem happened to me on at least two occasions and we were fortunate enough that it was only a nuisance (such as making me late to work) and nothing more severe. When I went into the Saturn dealership to buy the replacement part back in 2008, I suggested that the numerous reports on this problem warranted a recall from GM. The guys at the service center just shrugged, rolled their eyes, and quoted $200 to replace it. I purchased the part and did it myself. Now it's taken a decade to recall this part. GM claimed ignorance of the issue but in reality it's coming out that they knew of the severity of this problem back in 2006 and tried to keep it quiet. I traded in my Saturn shortly after the announcement of the disbanding of the brand. It became hard to find parts and even though they claimed that Chevy dealerships would stock them, I was told that it could take 1-2 weeks to get certain items on some occasions. Since then, I've never considered buying another product from GM. The factors that I mention above contributed to this and now this latest news just reinforces my distrust in the brand. Rate the quality of this post and help zborgerd reputation points. Click the reputation button near the bottom left corner of this message box. Thank you! Rate the quality of this post and help sw201444 reputation points. Click the reputation button near the bottom left corner of this message box. Thank you! Have not had it happen. The only thing on my key rings is the key and the factory fob. Rate the quality of this post and help daver reputation points. Click the reputation button near the bottom left corner of this message box. Thank you! Parts will be available Apr.7th. Sorta. Had a mirror image of the problem about 6 months ago. Wifey got to work one morning and couldn't shut it off. It didn't shut itself off, in fact it wouldn't shut itself off. The switch would turn to the off position, but the engine kept on running, and running, and running. So-o, some nice fella from the Munro shop next door pulled a fuse to stop it. The GM dealer replaced the switch to the tune of around $500. Think we'll get any reimbursement from GM? They replaced the ignition switch. We just got the recall notice, so now I wonder if GM doesn't know it was replaced, or if they replaced it with another defective part. As I said, the work was done by a GM dealer. I'll check back when we've gotten it in. Rate the quality of this post and help Ignatz reputation points. Click the reputation button near the bottom left corner of this message box. Thank you! I had the key get stuck at the on/run position. The car could only be shut off dumping my clutch with the brakes on and killing the engine that way, I would then disconnect the negative battery cable to avoid running the battery down. I could restart the car because the ignition allowed me to advance and start the car but I could not get to accessory or off position. When I got all the new parts and did the repair myself, I then removed the lock cylinder, the old cylinder was totally disintegrated, and it came out in many small pieces of metal and small springs. If I knew now back then, I would of parked the car sooner, I totally understand how all those wrecks must have happened. The new cylinder I installed claimed to be an updated version and looked totally different in design but fit perfect, I found a seller on ebay who sold them and keyed them if you provided the key code. My lock housing also was damaged and was the costly part to replace. My lock housing also was damaged and was the costly part to replace. Yeah, same here. After quoting me a price they called back to say they hadn't anticipated the housing and about doubled the original quote. Never got the plug for my ION. Had 2 failed switches replaced by the dealer, one under warranty, one not and did one myself with a Dorman aftermarket ignition. 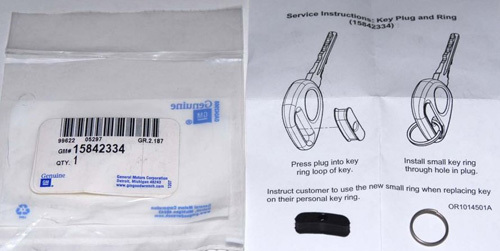 I never experienced the shutoff while driving and I only kept the Saturn key /fob and my Honda key on the ring. The ION was totaled a few weeks back. Hit while at a stoplight. I have been watching the decline of GM quality for many years and when they killed off Saturn and took the bailout, it really made me angry. Now with the news of this recall and their deliberate actions to not fix issues, I will not buy another GM product. For me GM crossed an ethical line and they cannot go back. I have been very pleased with our two Honda's and will be purchasing another later this summer when we pass the 08 CRV to our son. Rate the quality of this post and help johnk reputation points. Click the reputation button near the bottom left corner of this message box. Thank you! Please remember that for several years during this period the US Government owned General Motors. This ignition switch problem has come to light only after the company returned to private hands. An interesting question to pose to your congressman would be, "Why didn't you insist on better oversight while the government owned the company?" I am driving primarily Chrysler products presently, but we also have a Saturn Ion from my MIL. I've owned a number of GM products and my last one was the best: a 2001 Pontiac Grand Prix. 250,000 miles, only a couple repairs, and unbelievably, the fuel economy rivaled the Saturn (31mpg highway). When the ignition module died I donated it to Good News Garage. If they were still making the Grand Prix in 2009 I would have bought another. They weren't and I shopped around and bought a Jeep Patriot. Only 1/2 as many miles as my Pontiac but still running strong. Good luck with your Hondas; they have a good reputation. Point taken, however GM was a private company back in 2004/2005 when this problem originally surfaced. The Gov was only interested in keeping the lights on during their tenure. All good questions that need to be asked, but I doubt we will get any honest answers. A few people will get their hands slapped and a couple may outright lose their jobs, but I doubt those who were responsible for this will ever be charged. Very sad for those who lost loved ones due to a cheap fix not being implemented. Time for consumers to vote with their dollars and if you don't like what a company does, take your business elsewhere. Location: "The Heart Of It All"
My Key for my 2010 SKY Redline has just a hole like using that plug would create, but without that plug kit. I'm the original owner of my 2004 ION RL and 2007 SKY RL. Neither one has had the problems with the ignition. And I've carried keys for up to 6 cars at once on my key ring. I've had the 2010 for 7 months. No problem either. Rate the quality of this post and help 02OrangeSC2 reputation points. Click the reputation button near the bottom left corner of this message box. Thank you!